In 1945, the allies have finally gained ground and have pushed Hitler's army back and they are freeing the people who have been shoved under Hitler's imposing thumb. When I think of WW2, I think of the tragedy of the Holocaust, the landing of Normandy, the perseverance of England. Those are the most well known events of the war. 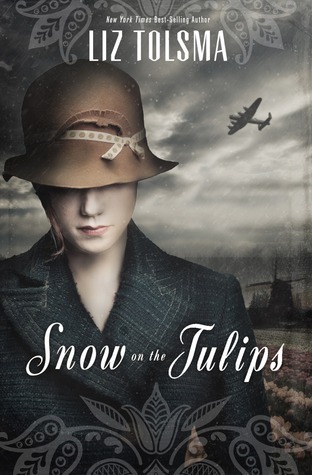 Snow on the Tulips by Liz Tolsma brought to my attention the hardship that Netherlands faced as they were occupied by the Nazi's. Cornelia is a widow, she lost her husband in battle with the Nazi's and has lived her life quietly through the war. As quietly as a person can live anyway as she hides her younger brother from the Nazis. Cornelia is content to live the quiet and unnoticed life, waiting for the allies to release the Netherlands. She is a woman who cares deeply for her remaining family and is willing to help them anyway possible. Cornelia is a strong woman in her own way, she resists the Nazis, she refuses to speak German, even though she is fluent. Gerrit is not a person who wants to sit quietly by till the end of the war, he wants to fight anyway he can. Because of that, it brings him to Cornelia's door, wounded and on the verge of death. He is nursed back to health by Cornelia and her siblings and with their help is able to avoid being caught by the Nazis again. Gerrit is a strong believer in fighting for what you believe in, no matter the cost. His passions give Cornelia something to think about with their time together. His faith is also a strong part of who he is and guides him in his toughest circumstances. This story is based on true events that happened in Liz Tolsma's own family. It is awe inspiring to me, hearing stories of survival during this nightmarish time in our history. This was a good story and set in a background I hadn't thought of, when considering WW2. Liz Tolsma has lived in Wisconsin most of her life. She and her husband have a son and two daughters, all adopted internationally. When not busy putting words to paper, Liz enjoys reading, waling, working in her large perennial garden, kayaking, and camping with her family. You can see more at www.liztolsma.com. Thank you to Thomas Nelson and Booksneeze, I received this book for free in exchange for an honest review. Thanks! Oh, wow! That is neat. Yes, all the towns listed are the real towns and at the end, Liz Tolsma gives the details to what happened. I didn't know much about what all happened in the Netherlands during WW2, but it was good to read about. I'm going to look more into it.